This is one of the best-known works of Fenton Hort (1828–1892), Professor of Divinity at Cambridge. Compiled in 1897, it is a posthumous record of a series of lectures delivered by Hort in 1888 and 1889, covering the origins and development of the early Church. Starting with a discussion on the meaning of 'ecclesia', Hort traces church history from the New Testament accounts of the Last Supper and the Resurrection to the problems Christianity faced in the second century. Hort conveys his meaning with absolute clarity, taking a scrupulous, almost scientific approach in his consideration of literary evidence. 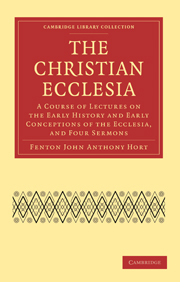 Four of his sermons are also included, and the book itself stands as a record of the last words spoken in public by Hort. The Christian Ecclesia provides a fascinating account of the beginnings of Christianity and is one of the most significant works by this prolific nineteenth-century theologian.